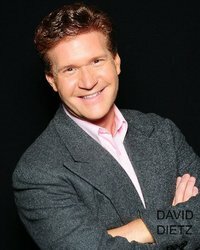 Hailing from the outskirts of Pittsburgh, PA, David Dietz is an award-winning actor, stage/screen writer, filmmaker, and audiobook producer/narrator. He has "pounded the boards" in productions ranging from Shakespeare to Simon (Neil, that is), and appeared in such films as "End Game," "Strange Girls," and "Death from Above." In 2012, he wrote, produced, directed, and starred in "Indemnity" (aka "Indemnity: Rage of a Jealous Vampire"). His audiobook narration credits include My Stupid Girl Words with My Father and Halfskin. He has also written three plays that have received numerous productions. For more information, please visit http://dietzthethird.com or http://zd3-productions.com. To ask David Dietz questions, please sign up. New Audiofile Review - "Vanished from Dust"
I'm honored to once again be featured in the "pages" of Audiofile magazine.
" Thanks, Harry! I appreciate your support. I'll gift you some codes this week. " " Still have lots of codes available! Hit me up if you're interested! " " Still have lots of codes available! Drop me a line if you're interested! " If you enjoy Dean Koontz's "Odd Thomas" series, you'll definitely enjoy this take on the guy who sees ghosts and uses his ability to prevent an otherworldly killing spree!
" Jonah Morrison, caretaker of the local cemetery, has always been a little "odd" ever since he witnessed a serial killer murder his parents. Now he com Jonah Morrison, caretaker of the local cemetery, has always been a little "odd" ever since he witnessed a serial killer murder his parents. Now he communes with the dead - and not just the ones buried in the ground! But, can his ability to call upon ghostly friends help protect the girl he loves from afar from becoming the next victim of a vengeful demon? We’d love your help. Let us know what’s wrong with this preview of Exodus by Andrea Domanski. We’d love your help. Let us know what’s wrong with this preview of Chaos by Andrea Domanski.